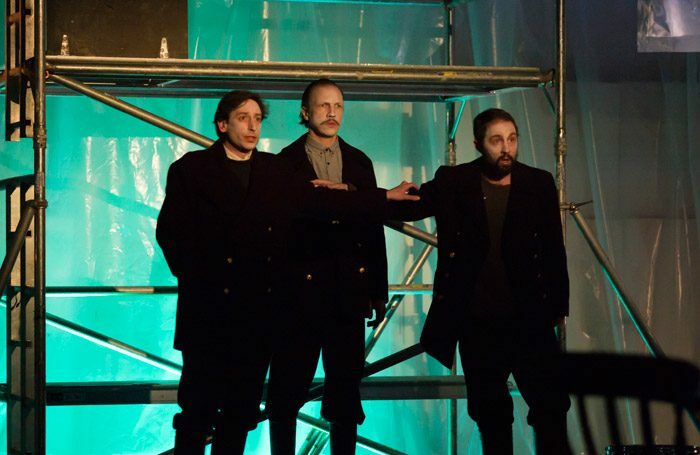 Peter Maxwell Davies’ violent, unsettling tale of three lighthouse keepers who disappear in mysterious circumstances is especially intense in the modestly-proportioned Hackney Showroom. Trapped in a confined space with a vigorous 12-piece orchestra and three male singers, the tension for the audience becomes almost unbearable. The young Shadwell Ensemble, conducted by Finnegan Downie Dear, gives a raw, sometimes overwhelming account of a score ranging from brutal 20th-century modernism to pastiche music-hall tunes. It’s not just the big brass and percussion effects that assault the senses – the strobe of the lighthouse beam and flashes of lightning batter the eyeballs and a queasy rocking effect is created by projecting the movement of water in a fish tank onto a screen. The set focuses on a central ring containing a kitchen table, ankle-deep in water, where the three keepers slosh around and wrestle with their inner demons. Pauls Putnins plays the driven preacher Arthur, his magnificent bass full of blood and thunder; baritone Owain Browne is Blazes, whose gruesome song reveals he is both abused and an abuser. The most affecting of the three is boyish tenor Paul Curievci as Sandy – his cliched love song arouses tenderness in his two companions. They embrace in a rare moment of cameraderie before their crazy visions drive them towards their hellish fate. Like “the horror!” in Conrad’s Heart of Darkness, the audience is left with a feeling of dread, but no clear idea of who dunnit, or what was done. It doesn’t matter – Furness and Downie Dear have created a spine-chilling setting for this operatic shaggy dog story.